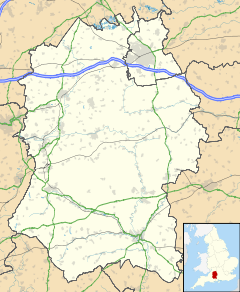 Sutton Benger is a village and civil parish in the county of Wiltshire, England, 5 miles (8.0 km) northeast of Chippenham. The parish includes the hamlet of Draycot Cerne. The Bristol Avon forms much of the eastern boundary of the parish. The main road through the village was the A420 which ran from Bristol to Swindon and Oxford. Following the building of the M4 motorway this section was reclassified as the B4069. Draycot Cerne and Seagry, formerly separate parishes, were added to Sutton Benger in 1934. In 1971 all land north of the newly built M4 was transferred to a recreated Seagry parish. The village has a primary school, a post office and a doctors surgery. The village hall has a recreation ground and a multi-use games area. Several community groups make use of the hall including a pre-school, Benger Bears, a playgroup, WI and Over 60's group. There is a pub - the Wellesley Arms, a restaurant - La Flambé, and a hotel/restaurant - The Bell House Hotel. The Anglican Church of All Saints is Grade II* listed. It has 12th-century origins and a 15th-century tower; it was heavily restored in 1851. St James's Church, Draycot Cerne was built around 1300 and declared redundant in 1994. In 2008 Faccenda Group closed their chicken processing plant in the village, with the loss of 450 jobs, moving production to another site. ^ "Wiltshire Community History - Census". Wiltshire Council. Retrieved 18 May 2015. ^ "Victoria County History - Wiltshire - Vol 14 pp186-194 - Parishes: Seagry". British History Online. University of London. Retrieved 18 May 2015. ^ "Sutton Benger COE Aided Primary School". Retrieved 18 May 2015. ^ "New home for Sutton Benger Post Office announced". The Wiltshire Gazette and Herald ». 21 March 2014. Retrieved 18 May 2015. ^ "The Wellesley Arms". Retrieved 18 May 2015. ^ "La Flambé". Retrieved 18 May 2015. ^ "The Bell House Hotel". Retrieved 18 May 2015. ^ Historic England. "Church of All Saints, Sutton Benger (1022403)". National Heritage List for England. Retrieved 18 May 2015. ^ "Church of All Saints, Sutton Benger". Wiltshire Community History. Wiltshire Council. Retrieved 18 May 2015. "Victoria County History - Wiltshire - Vol 14 pp221-229 - Parishes: Sutton Benger". British History Online. University of London. Retrieved 18 May 2015. "Sutton Benger". Wiltshire Community History. Wiltshire Council. Retrieved 18 May 2015. This page was last edited on 2 July 2017, at 00:42 (UTC).